So far we've been creating landlord and property records in the database. Next we'll create interfaces for adding them directly in the application. First we need a trigger to invoke a form for adding a new landlord record. Remember the first parameter in the addtab function is the key of the tab. In this case, we have a fixed value. This means we can have only one New Landlord form at any moment, which is suiting. Remember to leave out the one-to-many sections such as phone numbers or properties in the new record form. Once the record is created, the user will see the detail view where associated data can then be added. Note that we cannot use ajxpgn, addtab or reloadtab (unless you're using V3.2 or greater) to inject the view of the new record into a pre-defined container, as we've been doing with updating records before. This is because the containers require a unique ID, which is assigned by the database. The solution is to send a request to add the record. Get the new record's ID from the response and open a new tab while closing the New Landlord tab. The bolded lines in the above code ensure the response is a numeric value. The server response should not contain any extra white spaces. The die statement instantly terminates the script, eliminating all potential white spaces. Compare the above code with the previous listing. The first AJAX call creates a new record on the server side. It was initiated by the ajxb function, which blocks the execution until server response. Once the return value is validated, the original tab is closed and a new tab is added by calling the addtab function. The new version uses reloadtab function for the initial call. We may take advantage of the data parameter to deal with lengthy POST fields such as a description. The reloadtab function ensures that only one request is sent. Subsequent requests are ignored until the arrival of the first response. This feature is only available starting 3.2. In the callback function we could use the old fashioned "close tab, open new tab" sequence. Or we could simply "rekey and reload" the tab, though the process of closing and opening is noticeable clumsy. The issue with the previous approach is that the view index alone does not identify the state of the list view. It is possible that the user is looking at the second page of the list, or that the list is bearing a search keyword. Page- and keyword specific content is loaded in a sub container of the list view; in this case, "landlordlist". Why are the reload parameters not always loaded for the landlordlist container? When a container is loaded with ajxpgn, its reload params are guaranteed to be set. 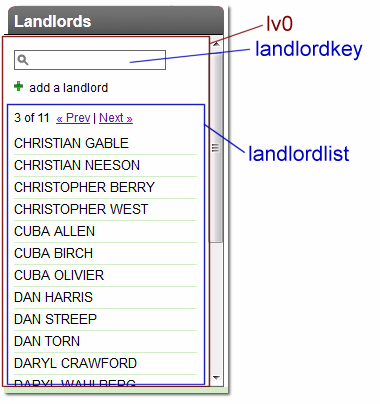 However, when the list view lv0 is first loaded, the landlordlist is loaded as part of the injected content. The second parameter in the reajxpgn function falls back to the main loader, offering the same behavior as showview in previous versions of Gyroscope.